At the beginning of the month the world around the greenhouse was surrounded by deep snow but today the only snow white on show is this lovely Cattleya species in our Warm Americas section. Cattleya loddigesii is a bifoliate (two leaved) cattleya species from Brazil. The species grows near the Atlantic coast of Brail from 600-900m and was once common in the swampy forests along the regions rivers including the Rio Grande, Rio Tiete, Rio Pardo. Unfortunately much of this forest is now gone and in Brazil we drove through an area where the species had been recorded which is now treeless low grade pasture. 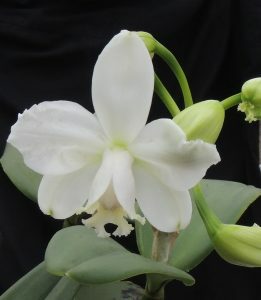 We have a few clones of Cattleya loddigesii and this alba clone is a robust plant with cylindrical pseudobulbs 40cm high that produces a strong flower spike between the two thick leaves with up to six large waxy flowers although there are fewer this year reminding us it is time to report this plant to give it some good fresh compost for this year’s new roots. We find the species thrives in a basket hanging in the roof of Warm Americas where it gets lots of light and dries out between watering.